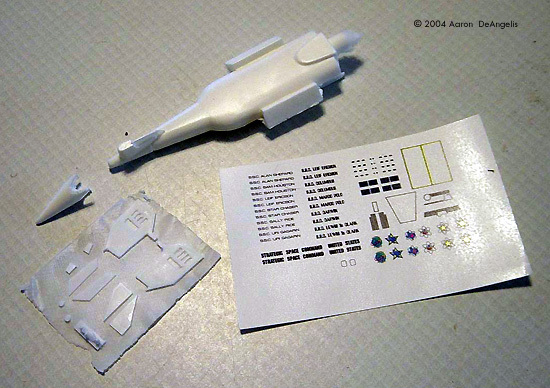 Instructions: One page with schematic; no decal placement guide. Molding Quality: 7- Some clean up required. Detail: 8- Some things are missing. Overall Rating: 7- Needs a little work, but builds up fine! 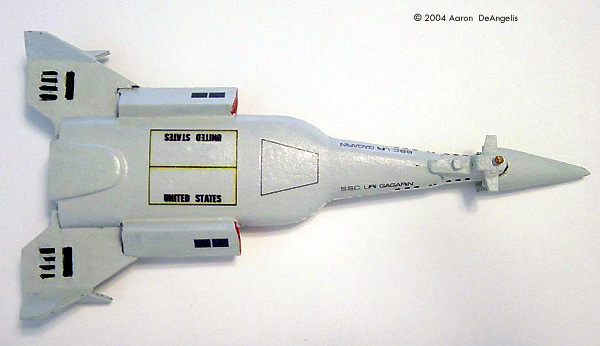 The Leif Ericson Galactic Cruiser, designed by Matt Jeffries, was the first of several planned kits in AMT's "Strategic Space Command" series - and as it turned out, the only one to be produced. 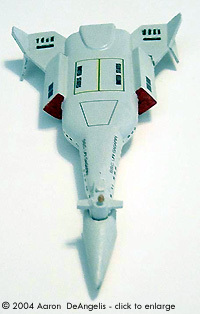 It's one claim to fame is as the inspiration for the INSS McArthur from Larry Niven & Jerry Pournelle's The Mote in God's Eye. I opened the bag, and gazed upon fifteen resin pieces (three of which are extras) an instruction sheet and a sheet of decals. The parts are nicely cast, for the most part. Some bubbles here and there, but nothing too bad. 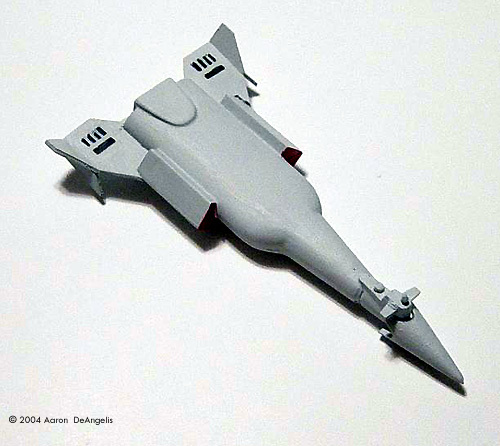 The hull's shape is off a little, and doesn't bulge slightly like it does in the box art of the original kit. 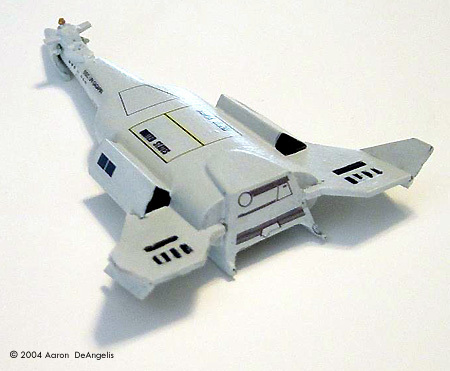 The instructions included are just a schematic of the finished model. 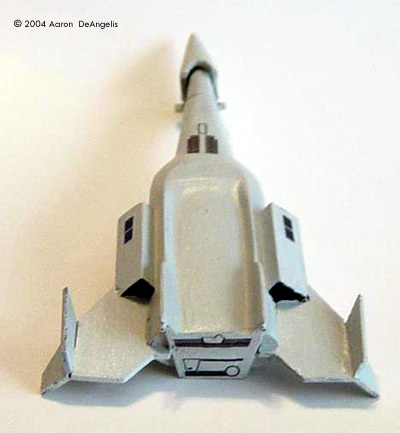 Smaller details, like the hatch and radome's location, are pointed out to you. Decal positions are not shown, which was a little annoying when applying them. On the hull piece the mold was slightly misaligned, making a half-millimeter break along the hull. The misaligned area is small, and can be quickly sanded down (or puttied up, I suppose.) There is a pour stub on the back that can be easily removed with a hand saw. The resin is nice and soft, so the saw had no trouble cutting it down. 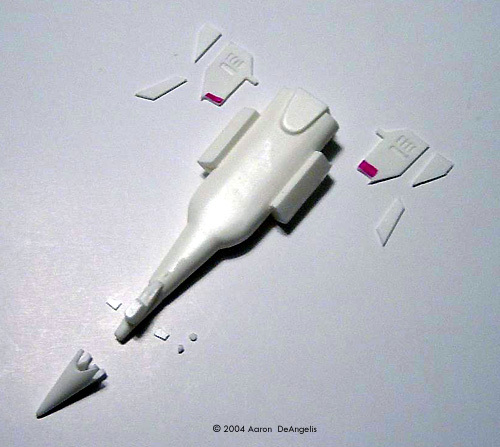 As I am building the "Mark I" version of this model, I removed the sail on the aft of the conning tower. 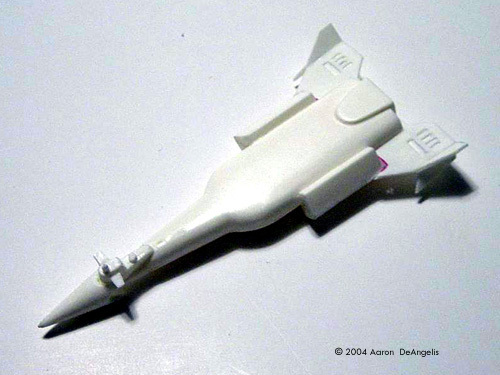 The wing segments and detail parts are all on one "sprue." 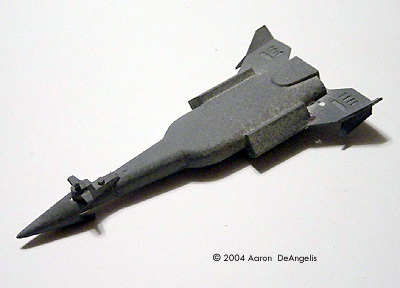 They need to be cut off and have the flash removed before being glued to the hull, or used as patterns for cutting styrene replacement wings. In my sample, the bubbling on the bottom of the cast wasn't too bad, and could easily be hidden with a bit of primer, so I decided to use them. The wings need a little trimming to fit onto the model. 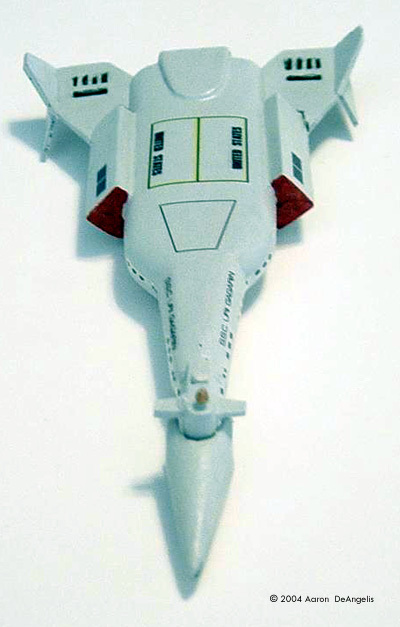 A few millimeters removed from the front of each main wing allows them to fit snugly to the hull. The "dive planes," radome and hatch are tiny little bits that you need to be extra careful with when placing in the hull. I painted the model in Model Master light gray, with engine exhaust and intakes in black and insignia red respectivly. I painted the sensor radome copper. Yep, that's about it. The decals were my favorite part of the model. They are very well done, and come off the sheet like opposed magnets. Names included are Alan Shepard, Sam Houston, Leif Ericson, Star Chaser, Sally Ride and (in '60's bubble letters) Leif Ericson, Columbus, Marco Polo, Darwin and Lewis & Clark. As the instructions were lacking, I took some creative liberties when applying them. The windows location I wasn't sure of, and I couldn't find references anywhere on the net. I did a little guess work looking at other peoples Leif's, and I think it came out about right. I named my vessel the SSC Uri Gagarin, after the first man in space. Many thanks to Jay Curtiss for the review sample. This page copyright © 2004 Starship Modeler. First posted on 21 April 2004.